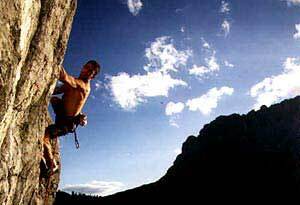 Cansla is synonymous with highly technical, multi-pitch dream routes in the heart of the Dolomites. Situated on the massive Sella group, it was first discovered in 1984 when Stefan Stuflesser and Carlo Grossrubatscher climbed the mega-classic "Traumpfeiler". In the years that followed many new routes were established and nowadays it is an excellent alternative for those who opt not against a nearby summit but for the spectacular atmosphere found in the Dolomites. Cansla distinguishes itself for its highly technical and delicate slab climbing. A winters strength training is of little use here: technique is required. The rock is excellent quality and festooned with pockets, edges, sidepulls, slopers, etc. Cansla is situated at 2000 m and climbing is possible in summer only. The wall faces southwest and receives the early-afternoon sun. It dries quickly even after heavy rainstorms. Take the A22 motorway and exit at Bolzano Nord. Follow signs to Val Gardena, and on to the Gardena and Sella pass. At the fork continue up to the Sella pass for 200m and park on the left in the large car park. From here continue on foot to the wall in just 10 minutes. There are numerous supermarkets, restaurants, pizzerie, hotels and B&Bs in Val Gardena. 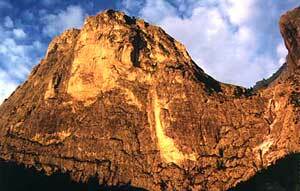 The nearest campsite is in Canazei in Val di Fassa. "Arrampicare intorno al Passo Sella" by Stefan Stufflesser and "Val di Fassa Climbing" by Renato Bernard and Gabriele Bonanno, available in all good bookshops and newsagents in Val Gardena.